Architecture passed down from one generation to the next never goes out of style. 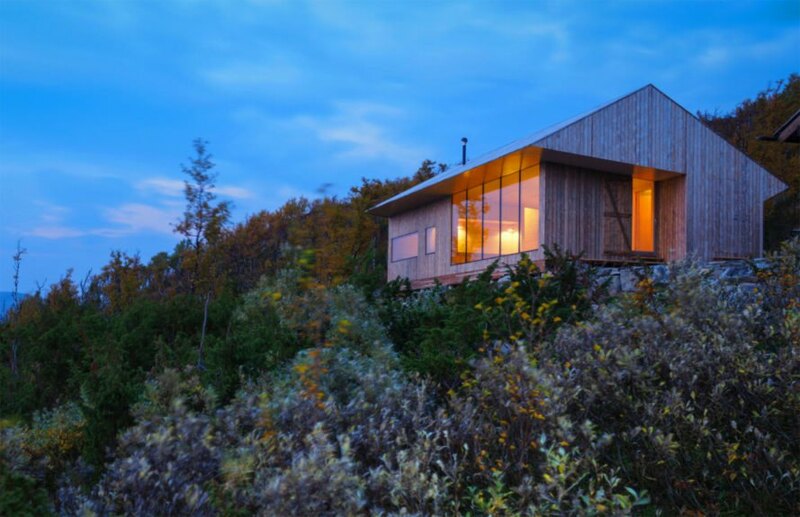 Architect Jon Danielsen Aarhus is the fourth generation of his family to build a cabin on the jagged terrain that covers the Norweigan region of Ustaoset. Aarhus built the beautiful pine-clad cabin using traditional construction methods with repurposed materials from his grandparents’ cabin, which was originally built on the same site in the 1960s. Ustaoset is 3,500 feet above sea level, with a topography that is not at all construction friendly. Although the architect reused as much material as possible from his grandparents’ 50-year-old wooden cabin, al new construction materials had to be flown in by helicopter or snow scooter during the winter months. The new cabin is built on the same location in order to reduce the new structure’s footprint as much as possible. The materials reused in the new design include the outside stairs and bench, which is made out of prior building’s old floorboards. Old stones taken from the original cabin’s foundation were repurposed as paving that leads up to the entrance. As for the remaining materials, the architect has plans to use them to build an outhouse in the future. To make the building site-specific, the design of the new cabin had to be resilient to the severe climate that includes strong winds and icy snow. Using the old cabin’s tried and true layout, the architect kept the original shape of the building by implementing traditional building methods, but added modern features such as solar protected glass panels. 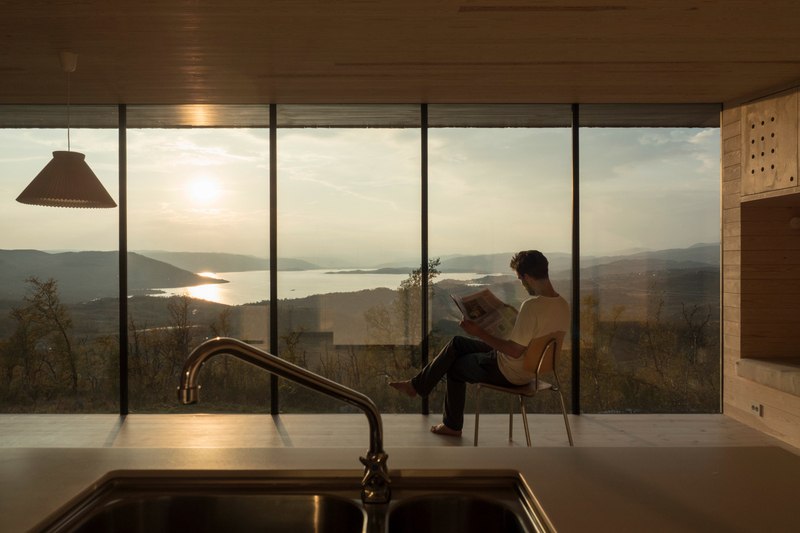 The large windows not only insulate the home and offer natural daylight on the interior, but provide jaw-dropping views of the Hallingskarvet mountain range, the Hardangerjøkulen glacier, and Lake Ustevann. As for the immediate landscape, Aarhus did the groundwork himself, forgoing heavy machinery for a shovel and wheelbarrow in order to protect the indigenous vegetation that grows in the high altitude. Architecture passed down from one generation to the next never goes out of style. Architect Jon Danielsen Aarhus is the fourth generation of his family to build a cabin on the jagged terrain that covers the Norweigan region of Ustaoset. Aarhus built the beautiful pine-clad cabin using traditional building methods with repurposed materials from his grandparents' cabin, which was originally built on the same site in the 1960s. Jon Danielsen Aarhus is the fourth generation in his family to build a cabin in the Ustaoset region. Ustaoset is 3,500 feet above sea level, with a topography that is not construction friendly. Although the architect reused as much material as possible from his grandparents' 50-year-old wooden cabin, construction materials had to be flown in by helicopter or snow scooter during the winter months. The new cabin is built on the same location in order to reduce the new structure's footprint as much as possible. The materials reused in the new design included the outside stairs and bench, which is made out of old floorboards. Old stones taken from the original cabin's foundation were repurposed as paving that leads up to the entrance. The cabin has stellar views of the surrounding landscape. The design has modern features such as solar protected glass panels. As for the remaining materials, the architect has plans to use them to build an outhouse in the future. Aarhus did the groundwork himself, forgoing heavy machinery for a shovel and wheelbarrow in order to protect the indigenous vegetation that grows in the high altitude. To make the building site-specific, the design of the new cabin had to be resilient to the severe climate that includes strong winds and icy snow. Using the old cabin's tried and true layout, the architect kept the original shape of the building. 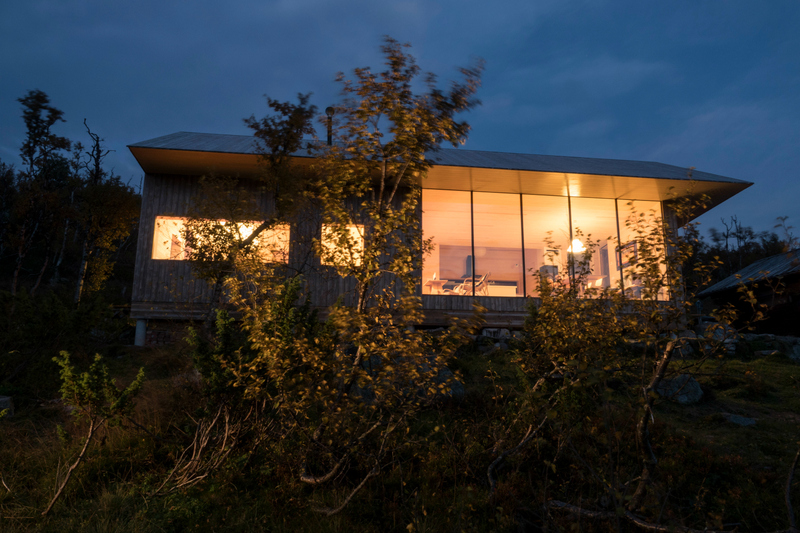 The large windows not only insulate the home and offer natural daylight on the interior, but provide jaw-dropping views of the Hallingskarvet mountain range, the Hardangerjøkulen glacier and Lake Ustevann. Like the exterior, the interior is clad in pine flooring and walls. The home has tons of natural light thanks to the abundance of windows. The cabin's interior is open and relaxing. 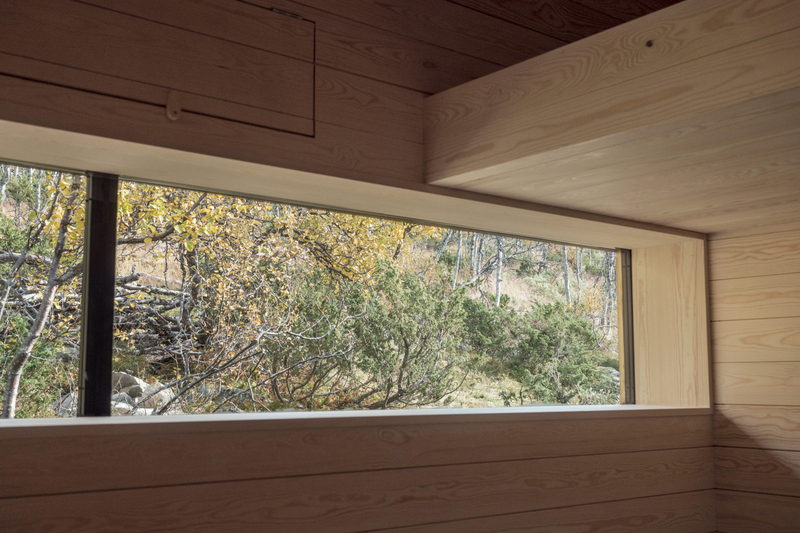 Modern features of the Ustaoset cabin include insulating windows. The cabin's interior is rustic, but comfortable. Wood covers the cabin's exterior and interior. Jon Danielsen Aarhus is the fourth generation to build on this site. 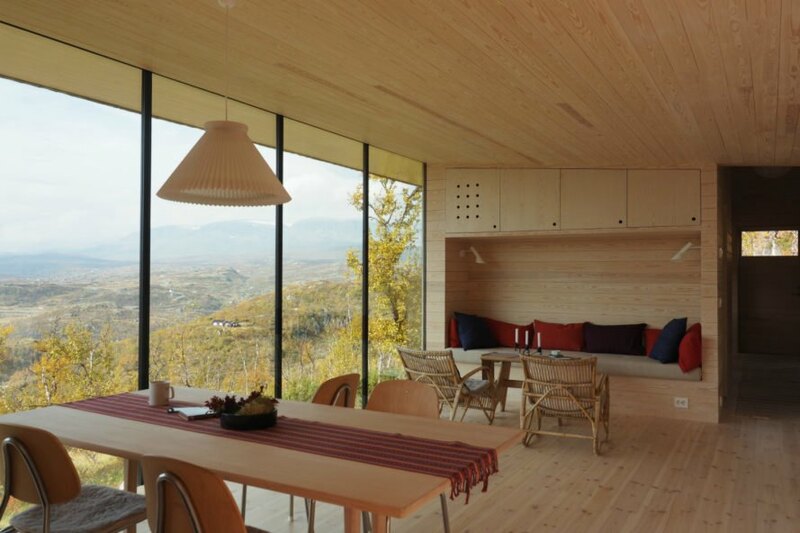 The Cabin Ustaoset is built on the same location as the architect's grandparents. Ustaoset is a difficult location to build. 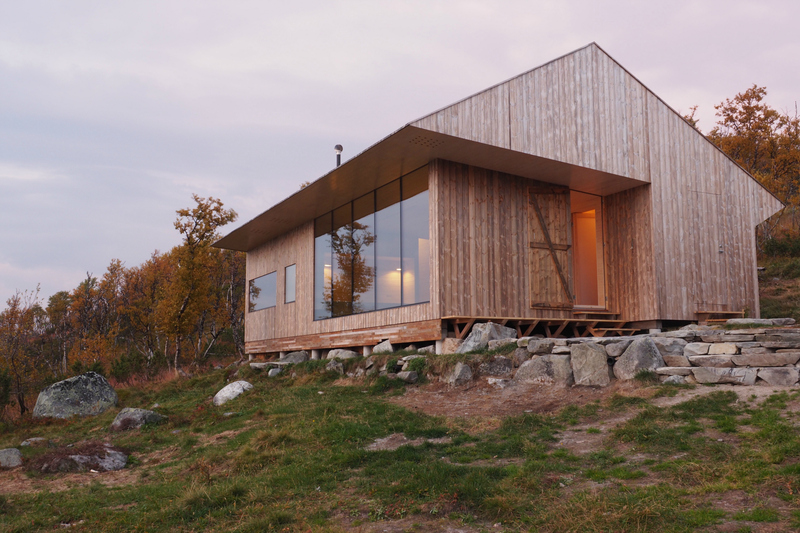 The cabin is an homage to the region's traditional building methods. 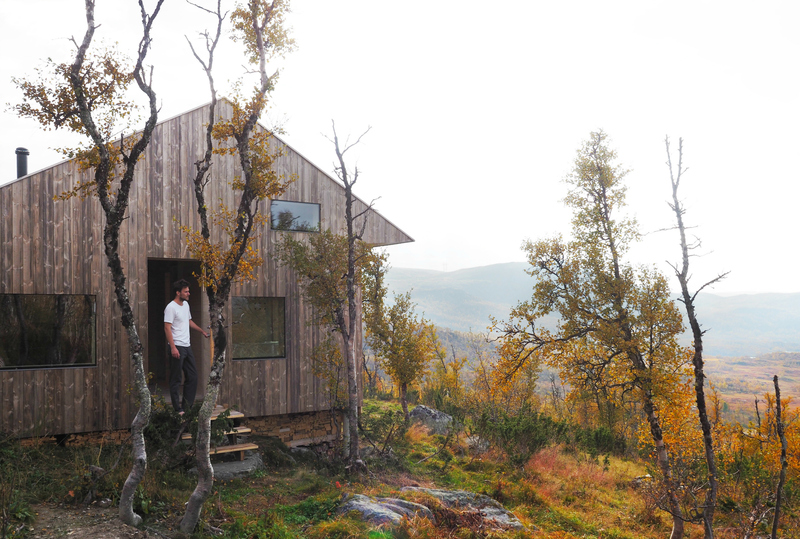 The Cabin Ustaoset is built with repurposed building materials. Cabin Ustaoset is set on an incline. The cabin sits buried into the jagged landscape.